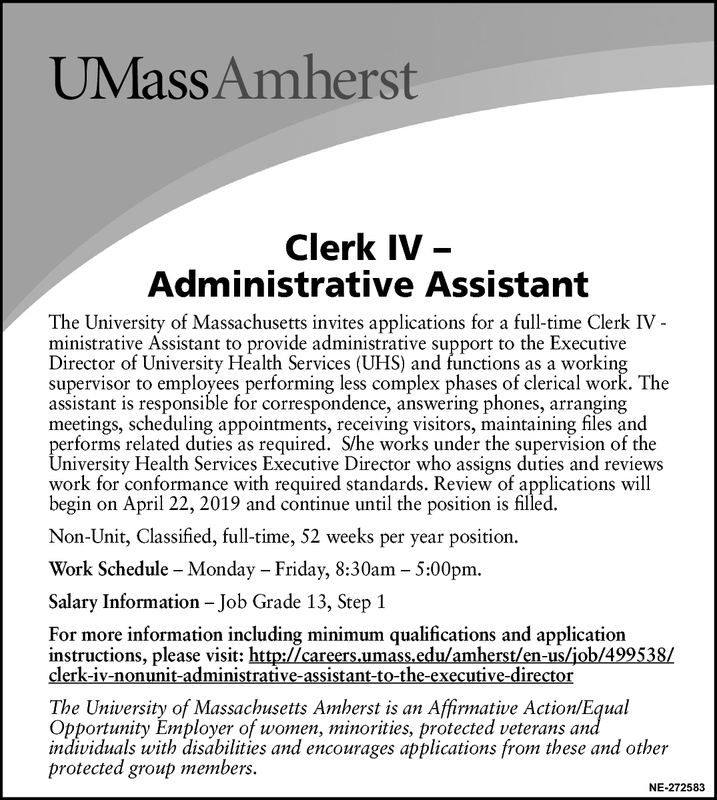 The University of Massachusetts invites applications for a full-time Clerk IV - ministrative Assistant to provide administrative support to the Executive Director of University Health Services (UHS) and functions as a working supervisor to employees performing less complex phases of clerical work. The assistant is responsible for correspondence, answering phones, arranging meetings, scheduling appointments, receiving visitors, maintaining files and performs related duties as required. S/he works under the supervision of the University Health Services Executive Director who assigns duties and reviews work for conformance with required standards. Review of applications will begin on April 22, 2019 and continue until the position is filled. Non-Unit, Classified, full-time, 52 weeks per year position. Work Schedule Monday Friday, 8:30am 5:00pm.